"I’ve been burping nonstop, everything I eat has been making me sick." "I was about four bites into it and I noticed it tasted a little different." 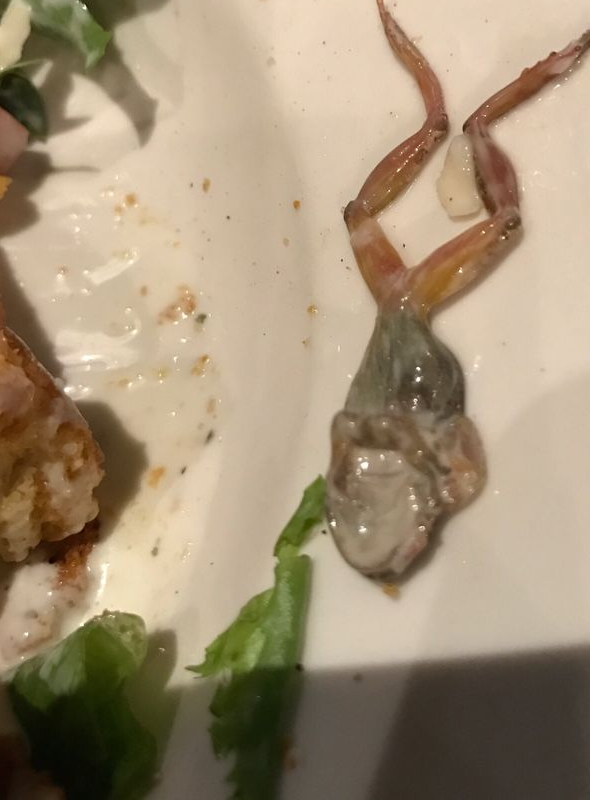 Lettuce, a little avo, chicken strips and a baby frog for taste -- this definitely wasn't what Shawna Cepeda had in mind when she opted for a healthy salad at a BJ's restaurant in Califonia recently. 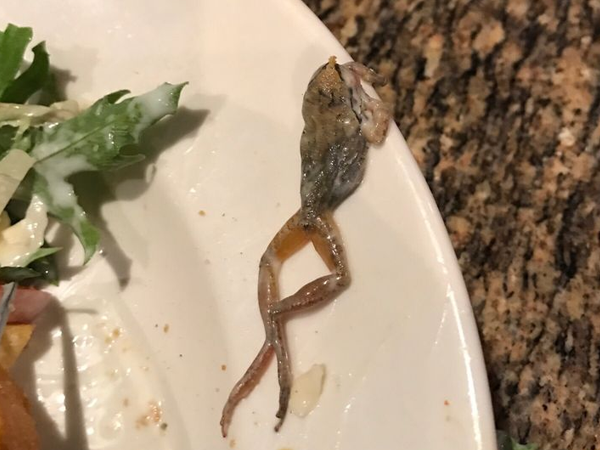 The 40-year-old was enjoying dinner with her husband and young daughter when she noticed something wasn't quite right with her meal. Speaking to The Mercury about that night, Shawna said, "I see something kind of rolled up. 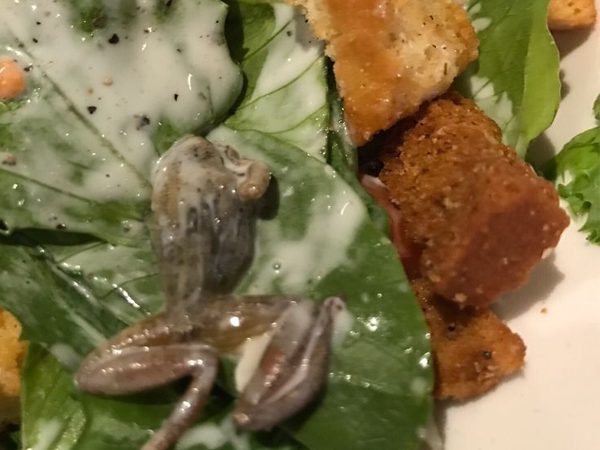 I was like, ‘this doesn’t look right,’ so I passed it to my husband, I asked, ‘Is that a piece of lettuce?’ Then he looked and my daughter looked at it and he was like, ‘it’s a frickin’ frog." "I noticed it tasted a little different I thought maybe the ranch dressing was a little bitter," she said. She immediately alerted staff who quickly disposed of the offending amphibian. The Los Angeles County Department of Public Health was called in to inspected the branch of the popualr franchise, but no health violations were found. The restaurant general manager, Krysteen Romero commented on a review posted by Shawna on Yelp that the restaurant takes situations like this very seriously, adding that BJ's has laucnhed an internal investigation and entered discussions with their suppliers and distributors. Shawna has expressed concern over how calmly she felt the staff handled the situation at the restaurant. "I can’t believe not only did it go through (their) produce vendor’s hands, but your hands and nobody happened to notice,” she said. The mom has also been to the doctor who cleared her of diseases such as salmonella, but did say that she may have some kind of other bacterial infection. He wrote her a prescription for antibiotics. "I’ve been burping nonstop, everything I eat has been making me sick. I don’t even want to look at a salad,” she said.